Complete Chest Training: A Safe Way To Train! As some of you already know, there is no such thing as the perfect workout. However, the workout outlined here is a very effective and safe chest builder... Learn about anatomy, exercises, stretching, sample workout, and more! The chest is one of most frequently trained muscle groups, and a favorite amongst many bodybuilders. It is such a noticeable muscle group that draws lots of attention. It is also a difficult muscle group to develop, and for good reason; most people improperly train their chest. As some of you might already know, there is no such thing as the perfect workout. 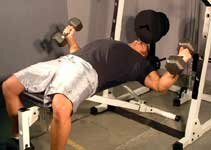 However, the workout outlined in this article is a very effective and safe chest builder, and I suggest you give it a try. Understanding the anatomy of the chest is essential and will allow you to know which parts of the muscle you're working. The pectoralis major is a large fan-shaped muscle that covers the rib cage. It consists of two parts, upper and lower. The upper portion, which originates from the clavicle, is known as the clavicular head, and the lower portion, which originates from the sternum, is known as the sternal head. The pectoralis major's primary functions are to flex, adduct, and medially rotate the arm. The pectoralis minor is a small, triangular muscle, located deep under the pectoralis major. Its primary functions are to depress and rotate the scapula downward. Although there are dozens of good chest building exercises, few are both safe and effective. I chose those few exercises, which also allow for long range of motion. Keep in mind that these aren't the only exercises you'll ever need to build your chest, because that's far from the truth. Just alternate the exercises in your workouts every couple of weeks, and expect to make continuous gains. Find Hundreds Of Exercises In Our Exercise Guide Here! This exercise targets the upper pecs, which tend to be difficult to develop. If you look at most bodybuilders' physiques, you'll see a lack in upper pec development. Many attribute this to genetics, and I absolutely agree, but there are other factors that are also involved. 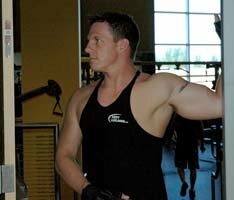 First off, most people improperly train their upper pecs. 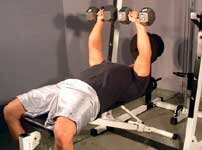 Unlike popular belief, performing incline bench presses set on a 30 degree angle doesn't fully target the upper pecs. 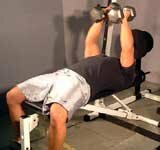 To shift all the work onto the upper pecs, the bench needs to be set to 60 degrees. 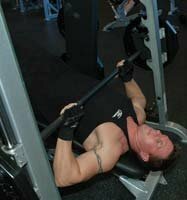 For those who have tried 60 degree incline bench presses and felt that their shoulders were mostly worked, chances are they were performing the exercise with bad form. The correct way to perform incline bench presses is as follows. Drop your elbows and place them slightly forward, stick your chest out, place your shoulders back, and turn your wrists at an angle so your thumbs are up and your hands are forming an upside down v. If you do this correctly, you will feel all the work on your upper pecs. The reason I included flat dumbbell instead of flat barbell bench pressing is simply because dumbbells are safer and they allow for longer range of motion. The most common mistake when performing this exercise tends to be chest and shoulder positioning. The shoulders are usually placed forward and the anterior delts take over the movement, while the emphasis of the pecs decreases. To avoid that, make sure you stick your chest out, place your shoulders back, and squeeze your chest after each rep. This exercise is an excellent chest isolation movement. Just like in flat dumbbell bench presses, stick your chest out and place your shoulders back. The reason I keep mentioning this is because it will help you fully stimulate your pecs while minimizing the work on secondary muscle groups. This is the final exercise in the workout, and by the time you get to this exercise, your pecs should be nearing failure. For that reason, you'll be using a machine to prevent possible injuries. This exercise targets the lower pecs and is a good finisher to the workout. I can't emphasize enough the importance of stretching the chest. Many people often train their chest more so than their back, and overtime that causes a muscular imbalance. This is known as the rounded shoulder posture, because the shoulders are pulled forward towards the chest. That can lead to injuries, make the chest look smaller when standing relaxed, and ruin symmetry. To correct this postural deficiency, I recommended you stretch your chest several times a week, and don't neglect training your back muscles. This is the best stretching movement for the chest. The correct way to perform this stretching movement is as follows. Stand next to a wall, bend your arm to form a capital L, place the inside of your forearm on the wall, and turn your body away from your bent arm. If you place your elbow lower on the wall, the upper chest becomes more stretched, and if you place your elbow higher on the wall, the lower chest gets more stretched. The straight arm chest stretch is very similar to the bent arm chest stretch. Stand next to a doorway, extend your arm, place the hand of the extended arm on the doorway, and turn your body away from your extended arm. If you place your hand lower on the doorway, the upper chest becomes more stretched, and if you place your hand higher on the doorway, the lower chest gets more stretched. I suggest you perform the workout outlined below only once a week, so your chest can fully recover in between workouts. It is not uncommon to see people who train their chest multiple times a week and end up overtraining. In case you didn't already know, not only can overtraining hold you back from making progress, but it can cause serious injuries. To prevent that from happening, I advise you train your chest only once a week. I also suggest you take a week off from training every couple of months, so your muscles can fully recover from all the training. Click Here For A Printable Log Of Chest Workout. After trying this workout for a couple of weeks, I recommend you assess your progress and make changes accordingly. Also, make sure to always target your weak points first in the workout, and don't neglect training any muscle groups so you can maintain balance and symmetry.